Republicans are scapegoating the respected community advocacy group for Wall Street's disastrous lending spree. Editor’s Note: ACORN, the grassroots community organization now under fire after staffers at four sites were caught on video offering potentially fraudulent mortgage advice to conservative activists posing as a pimp and a prostitute, is a favorite target of the right wing. During the 2008 presidential campaign, ACORN was subject to broad-based attacks for isolated incidents of voter registration fraud. While the accusations against ACORN differ, the animus remains the same. In a piece from October 2008, Peter Dreier and John Atlas demolish conservative claims that ACORN was to blame for the subprime mortgage collapse. An increasingly desperate Republican attack machine has recently identified the community organizing group ACORN as Public Enemy Number One. Among ACORN’s alleged crimes, perhaps the most serious is that it caused, nearly single-handedly, the world’s financial crisis. That’s the fantasy. In the reality-based world, it was ACORN that sounded the alarm about the exploitative lending practices that led to the current mortgage meltdown and financial crisis. Since the 1970s ACORN, which has 400,000 low- and moderate-income “member families” in more than 100 cities in forty states, has been warning Congress to protect borrowers from the banking industry’s irresponsible, risky and predatory practices–subprime loans, racial discrimination (called “redlining”) and rip-off fees. ACORN has persistently called for stronger regulations on banks, private mortgage companies, mortgage brokers and rating agencies. For years, ACORN has alerted public officials that the industry was hoodwinking many families into taking out risky loans they couldn’t afford and whose fine print they couldn’t understand. On September 10 on Fox & Friends, National Review columnist Stanley Kurtz described ACORN as “a group of community organizers [who] specialize in putting pressure, really kind of intimidation tactics, on banks, to get these banks to make high-risk loans to low-credit customers…. They even show up at the homes of bank officials to scare them and their families. They send demonstrators into the lobbies of banks, all to get the banks to make these high-risk loans to people with low credit.” McCain’s anti-ACORN attack video is almost a word-for-word duplication of Kurtz’s comments. The right-wing case against the CRA is entirely bogus–a diversionary tactic to take the heat off the financial services industry and its allies, like McCain. The CRA applies only to depository institutions, like commercial and savings banks, but thanks to Congress’s deregulation mania, there are now many other lenders, including private mortgage companies like CitiMortgage, Household Finance and Countrywide Financial (which was recently bought out by Bank of America). These outfits, which exist in a shadow world without government oversight, account for most of the predatory loans in trouble today. When Congress enacted the CRA in 1977, the vast majority of all mortgage loans were made by lenders regulated by the law. In 2006 only about 43 percent of home loans were made by companies subject to the CRA. Indeed, the main culprits in the subprime scandal–the nonbank mortgage companies, which successfully grabbed the bulk of the mortgage market away from the CRA-regulated banking industry–were not covered by the CRA. Wall Street investment firms–including Lehman Brothers, Goldman Sachs, Bear Stearns and Citigroup–set up special units, provided mortgage companies with lines of credit, then purchased the subprime mortgages from the lenders, bundled them into “mortgage-backed securities” and sold them for a fat fee to wealthy investors worldwide, typically without scrutiny. By 2007 the subprime business had become a $1.5 trillion global market for investors seeking high returns. Because lenders didn’t have to keep the loans on their books, they didn’t worry about the risk of losses. Congress passed the CRA after many studies, using the banks’ lending data, had documented widespread racial discrimination in mortgage lending. The CRA encourages federally chartered banks to examine the credit needs of the communities they serve and to lend based on these needs–for small businesses, homes and other types of loans. It does not require banks to make loans to businesses or people who can’t repay them. It does not ask banks to engage in charity. It simply tells banks: don’t discriminate against qualified borrowers. At first, many banks were reluctant to make loans to minority borrowers seeking to fix up their homes, buy new ones or start new businesses in urban neighborhoods. In the late 1970s and early ’80s, community organizing groups like ACORN, National People’s Action and others pushed banks and federal regulators to remove their racial blinders. Once they did so, banks discovered that many working- and middle-class black and Latino borrowers were excellent customers with good credit histories. These new markets generated good profits on stable loans with little risk. The explosion of subprime mortgages was touched off in the early twenty-first century, as the number of lenders regulated by the government and covered by the CRA dramatically dwindled. In 2002 subprime loans made up 8 percent of all mortgages; by 2006 they had soared to 20 percent. Since 2004 more than 90 percent of subprime mortgages have come with exploding adjustable rates. Not surprisingly, the foreclosure rates on subprime, adjustable-rate and other exotic mortgage loans have run four to five times higher than the foreclosure rates on conventional CRA mortgages. Testifying before the House Financial Services Committee in February, University of Michigan law professor Michael Barr reported that only about 20 percent of subprime mortgages were issued by banks regulated by the CRA. The other 80 percent of predatory and high-interest subprime loans were offered by financial institutions not covered by the CRA and not subject to routine examination or supervision. “The worst and most widespread abuses occurred in the institutions with the least federal oversight,” Barr told Congress. In contrast, the CRA actually penalizes banks for reckless, irresponsible or otherwise predatory lending. According to Ellen Seidman, director of the Treasury Department’s Office of Thrift Supervision from 1997 to 2001, federal regulators warned CRA-covered institutions that “badly underwritten subprime products that ignored consumer protections were not acceptable.” Lenders not subject to CRA did not receive similar warnings. While the CRA helped boost the nation’s homeownership rate, particularly among black and Latino borrowers, subprime and other exotic mortgages had very little impact on homeownership. Most subprime loans were refinances of existing mortgages. From 1998 through 2005, more than half of all subprime mortgages were for refinancing, while less than 10 percent of subprime loans went to first-time home buyers. Moreover, a significant number of borrowers who took out subprime loans could have qualified for conventional, prime-rate mortgages with much better terms. Even the Wall Street Journal acknowledges that “plenty of people with seemingly good credit are also caught in the subprime trap.” Brokers and lenders misled many of these homeowners, replacing safe thirty-year fixed-rate mortgages with deceptive, risky loans. The CRA gave federal regulators the power to deny approval for lucrative bank mergers or acquisitions if the companies engaged in persistently irresponsible or discriminatory lending. Under Reagan and George W. Bush, regulators failed to enforce the law, so activist groups like ACORN used the CRA to hold banks accountable. They conducted their own studies, uncovered banks with a pattern of irresponsible lending, exposed these practices to the media and demanded that regulators do their job. To avoid costly and harmful confrontations, many lenders forged “community reinvestment agreements” with ACORN and other community groups, pledging to make loans to borrowers who could afford them and whose neighborhood banks had ignored them. According to a study by the Harvard Joint Center for Housing Studies, the CRA helped catalyze more than $1 trillion in bank lending. ACORN and its allies, including the Center for Responsible Lending, the Greenlining Institute, the Center for Community Change and the National Community Reinvestment Coalition, carried on the battle against abusive lenders on many fronts to ensure that loans in minority areas did not put borrowers in risky situations. ACORN’s homeownership counseling program for prospective borrowers was successful in helping families avoid taking out loans they could not afford. In 2006 the foreclosure rate of loans to borrowers who went through ACORN’s homeowner counseling program stood at .032 percent. ACORN and other consumer groups fought for rules requiring lenders to document that borrowers had the ability to repay. They warned that adjustable-rate mortgages–those that started with a low “teaser” rate, which would adjust to a much higher rate later–were a ticking time bomb and that such loans should be made only to people who were able to afford the regular rates after the teasers had run out. But the lenders and the securitizers (Wall Street firms that packaged loans into mortgage-backed securities and sold them)–and too often the regulators and the lawmakers–didn’t heed the warnings. The industry convinced its political cronies that government regulation was too costly and cumbersome. ACORN and its allies opposed banks whose fees and other charges inflated the cost of loans while padding their profits from transactions and diminishing the long-term safety of these loans. These groups denounced compensation systems that rewarded lenders and brokers for putting borrowers in higher-cost loans regardless of their credit-worthiness. They exposed the outrageous practice called “yield spread premium.” This is a kickback from lenders to brokers for selling loans that are more expensive than what borrowers qualify for. It is essentially a bonus for cheating the borrower and upping the risk of default. Earlier this year, after a long battle by the Center for Responsible Lending, the first state–North Carolina–made this practice illegal. ACORN joined other consumer advocates and lawyers to promote the notion of “assignee liability”–arguing that companies that buy, and profit from, loans bear responsibility for illegal acts committed when those loans were originally made. Without it, the mortgage originators, who typically hold loans briefly before they sell them, can make fraudulent or risky loans without suffering any consequences. Again and again, Wall Street argued that it was too burdensome to scrutinize the loans they were buying or to be held responsible for the original transactions. Several of ACORN’s battles were notably successful. It got some major lenders to reduce the outrageously high interest rates and fees they charged borrowers. For example, in 2001 ACORN persuaded Household Finance Corporation to abolish its practice of selling bogus credit insurance that had been costing a billion dollars a year straight out of homeowners’ pockets. ACORN’s activism spurred state attorneys general to sue Household Finance in 2002, forcing the firm to distribute a record $484 million to abused borrowers. In a separate suit against Household Finance, ACORN won a $150 million settlement that it put partly into a foreclosure prevention fund. 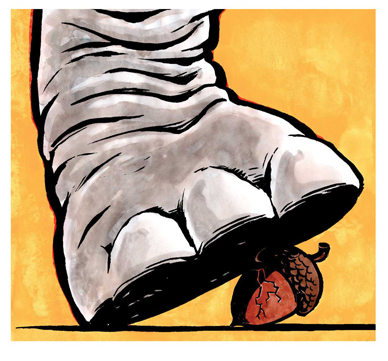 But ACORN and its counterparts have only been able to stick their fingers in the crumbling dike of American finance. Their warnings were prescient, but their victories were too small, their opponents too strong. So it is richly ironic that John McCain–a longtime ally of the banking industry whose mentor Phil Gramm orchestrated the 1999 Financial Modernization Act, opening the floodgates to irresponsible lending practices–is trying to scapegoat ACORN for the subprime crisis. Powerful business groups and their right-wing allies will continue to attack ACORN because it exposed and battled the real culprits of the financial crisis.